The evening of July 14, 1935 was a clear, perfect summer night at the Potomac River. The colors of the sunset gleamed off the water as the sun set over the Virginia hills. A cool breeze wafted over the shoreline and gently grazed the damp grass. On the river bank, just behind the Lincoln Memorial and parallel to the Arlington Memorial Bridge, 10,000 Washingtonians, dressed in flannel and gingham, sat on blankets and newspapers. Out on the water, hundreds of others dressed in bathing suits floated in canoes, eager to experience Washington’s newest summertime tradition: floating concerts by the National Symphony Orchestra. Yes, you read that right. The NSO was taking to the water, inaugurating a new “Sunset Symphony” series, wherein the orchestra would offer summertime performances on a 75 foot concert barge bobbing in the Potomac River. Hans Kindler, founder and first music director of the NSO, stepped up to the podium and looked out. For this unbelievable sea of people, Kindler conducted the orchestra in Wagner’s Die Meistersinger, Franck’s D minor Symphony, Johann Strauss’s Voices of Spring Waltz and Perpetuum Mobile, Brahms’ Cradle Song, and finally, the grand finale of Tchaikovsky’s 1812 Overture complete with cannons. The enormous crowd erupted in a rumble of bravos and clapping after every selection. As Kindler suggested, the successful Sunset Symphony series debut did not come about without some challenges. When the NSO was founded in 1931, money wasn’t available to finance summer symphony activities, and there wasn’t an outdoor location large enough to support the Symphony. Furthermore, disputes ensued between the Musicians’ Union and the orchestra directors. To ensure that the orchestra’s quiet sound carried all the way from the barge in the water to the steps of the amphitheater, the Symphony association had a “system of sound amplifiers, which [would] disperse the music without distortion,” installed on the barge. After some “tests proved the amplifying apparatus to be entirely satisfactory,” the orchestra could be heard flawlessly from the water, to the top of the bridge, and up through the white stone steps of the Watergate. It took a lot of hard work and help, financial and otherwise, from the United States Navy, Federal relief agencies, and the musicians themselves, but the NSO finally had an outdoor summer home! It was a big achievement. For the National Symphony as an entity, the Sunset Symphony series signaled a step forward on the orchestra’s path as a rising major orchestra. Indeed, more established American orchestras had already started offering informal summer concert seasons for their patrons, such as the program that the Philadelphia Symphony provided at Robin Hood Dell. Washingtonians paying between 25 cents and $1 could be assured a seat right on the steps of the Watergate, while thousands of others lined the water, bridge, and grass to listen for no charge at all; the advantage of outdoor space provided many who could not afford the time or money to see the symphony during its regular winter season at D.A.R. Constitution Hall with the opportunity to enjoy the music. The audience occasionally even included President Franklin Delano Roosevelt listening from the Presidential Car. The crowds coming out to see Sunset Symphony concerts only increased with each new season. The National Symphony played concerts on the floating barge at the Watergate for six weeks every summer from 1935 until 1965, and concerts routinely attracted upwards of 15,000 people. In 1965, National Airport started servicing commercial jet planes which created a consistent overhead rumble that was too loud and distracting for the outdoor concert series. It was then that the floating barge saw its last concert with the National Symphony, and the band shell was towed away from its Watergate Amphitheatre location. Rumor has it that a couple trumpet players from the Symphony stood on the shore of the Potomac and played Taps as the barge was unmoored. 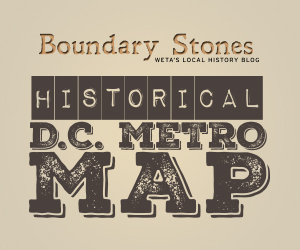 ^ Video: Bygone DC | Watch WETA Documentaries Online | WETA Video. 2017. http://watch.weta.org/video/3005381688. Today, Mr. Smith Goes to Washington is recognized as a great movie. But it didn’t have many fans in the nation’s capital when it was released. D.C.’s first modern department store set up shop in 1880, and served District residents for over a century before finally shutting its doors.